The greens of the Irish landscape are echoed in the varied colors of green tree agate. 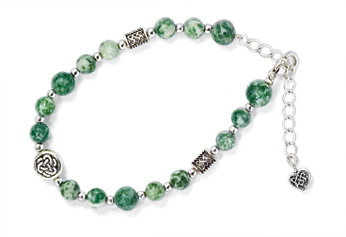 In this bracelet, verdant beads join with silvery eternal knotwork beads, for a statement of lasting connection to the land. Natural stone; colors will vary. Bracelet adjusts 7 1/2" to 9". Made in Ireland. The bracelet has an extension on it and it makes it difficult to put on. Why put a small heart at the end of the extension? I am returning it - sorry, really liked the colors and style of the bracelet. Owner Response:Thank you for your review, Ann! We're always happy to assist with an exchange or return if any of our products do not meet your expectations; please give us a call at 800-207-4256 if we can help.